Reorganized the closet recently and was happily reunited with this skirt (it was hiding in the very back). Don't you just hate it when good skirts go missing like that?! Love that printed pencil skirt and the neon really pops! That skirt and bag has me dreaming! Lovely and fun outfit! I Like your skirt a lot! Love the kaliedescope print of this skirt! Looking good! you always have the most unique and stunning pieces. Such a pretty skirt and I love the pop of unexpected color in the purse!! I just did a post (http://www.fashionatforty.blogspot.com/2012/02/wake-me-up.html) on a similar bag (mine was a much cheaper version from Old Navy). Yours is fantastic! And I love the skirt!!! Oh I love the zara print skirt! This outfit reminds me of an indiana jones movie or something! Girl - you're killing that skirt! that skirt is everything girlfriend! oh and your hair is so cute! Love the look... you always look well put together! stay chic! I love the bag! Your such an inspiration! 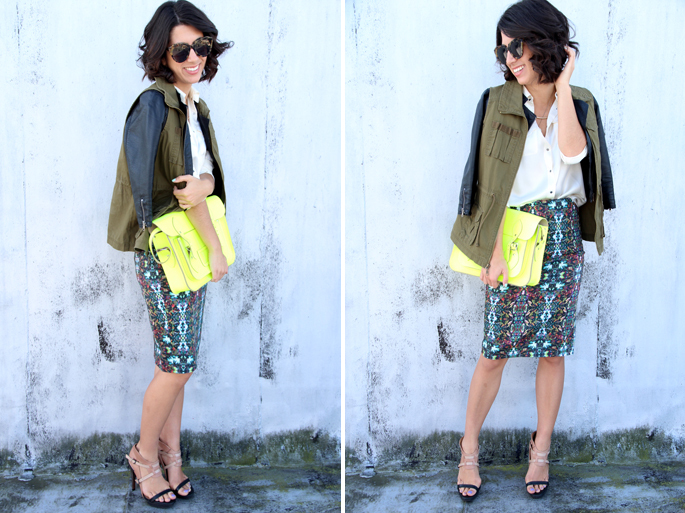 LOVE the skirt and I am so on the hunt for a neon satchel! Looking FAB girl! This skirt is one of my favorites! It's so fun! Wow, that bag is amazing, totally out of control! Love your blog! The unique pattern of the skirt is amazing. Great skirt, glad you found it! very cool outfit! i want that bag!! You are literally wearing all my current obsessions: that skirt, that jacket, that bag are the top 3 on my wish list!! Great outfit, I like the mix of edgy casual with ladylike and the print on the skirt is gorgeous. One of my very favorite posts of yours ever.. and that is saying a lot! Gorgeous! I'm your new follower. You are beautiful! I like your style! I can't believe you forgot about this beauty! Love how you paired it with a more casual coat and neon clutch! 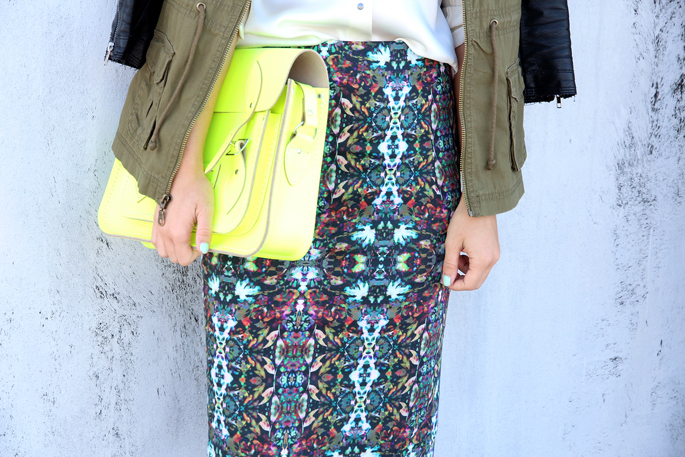 love the neon and the printed skirt! You look so pretty! What a great clutch! Amazing look! Love the bag!!!!!! I love the skirt and how you mixed high end with cheaper finds! I really, really dig this skirt - the print is fantastic! This is inspiring me to pull out my sewing machine! love finding things and making them new again! This skirt is amazing! Memo : tmr shopping stop at zara ;).